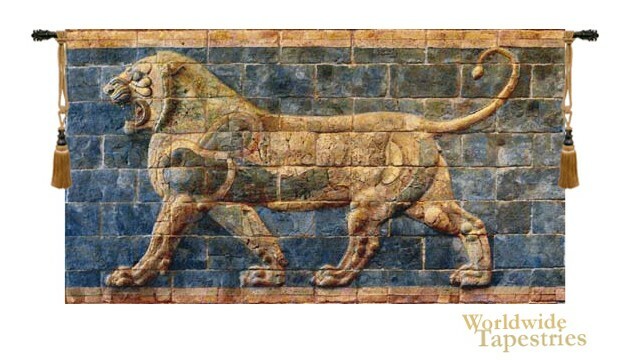 In Lion II - Darius tapestry, we see a lion from the Ishtar Gate, the 8th gate to the inner city of Babylon, constructed at about 575 BC by order of King Nebuchadnezzar II. The gate is a wonder of the world and is made from the beautiful and rare blue stone lapis lazuli. There is a parade of animals depicted on this blue construction including the lion. Aurochs and dragons also decorate the piece of art and architecture. The city of Babylon was part of ancient Mesopotamia, built upon the Euphrates. This Lion II - Darius tapestry is backed with lining and a tunnel for easy hanging. Note: tapestry rod and tassels, where pictured, are not included in the price. Dimensions: W 56" x H 32"
Dimensions: W 78" x H 42"